Why is there an increasing interest in wine quotes? Vino was an essential in facilitating dialogue in ancient Greece. It continued to hold the same importance over the centuries. It became part of social settings where reasoned discussions were at the core of the social gathering. Whether it was politics, philosophy, or any other topic, it became an integral part of most such settings. It has always had a unique place in history – for the rich, the poor, the royal and the commonplace – everyone! So, if you’re of age and enjoy a glass (or two), pour a glass as you peruse this exquisite collection that get better with age. Here are some of the most famous insights on the juice of grapes. Sometimes called “the grape” or by vintage, this drink has fascinated folks from around the world for a very long time. It’s made traditional from grapes, but berries and even dandelions can be a content source. I make vino disappear; what’s your super power? Vino…because no great story started with someone eating a salad. Seven days without vino makes one weak. The University of Nebraska says that elderly people that drink beer or wine at least four times a week have the highest bone density. They need it – they’re the ones falling down the most. Drink wine: it isn’t good to keep things bottled up. You can’t buy happiness, but you can buy wine and that’s kind of the same thing. They say a glass is good for you. So two glasses must be better? One not only drinks wine, one smells it, observes it, tastes it, sips it and – one talks about it. Wine makes a man more pleased with himself, I do not say that it makes him more pleasing to others. Wine can be considered with good reason as the most healthful and hygienic of all beverages. Wine is poetry in a bottle. Wine makes all things possible. Being a wine enthusiast means you care more about quality than quantity. The first kiss and the first glass of wine are the best. Better is old wine than new, and old friends like-wise. For when the wine is in, the wit it out. Wine gave a sort of gallantry to their own failure. I am not old but mellow, like good wine. Did you know that women are better at wine tasting than men? It’s all about smelling and women have a better sense of smell. Read more Interesting Vino Facts. He looked as if he had been beaten to death with a wine bottle, but by doing it with the contents of the bottle. Wine brings to light the hidden secrets of the soul, gives being to our hopes, bids the coward flight, drives dull care away, and teaches new means for the accomplishment of our wishes. Wine to me is passion. It’s family and friends. It’s warmth of heart and generosity of spirit. Wine is art. It’s culture. It’s the essence of civilization and the art of living. Wedlock’s like wine – not properly judged of till the second glass. 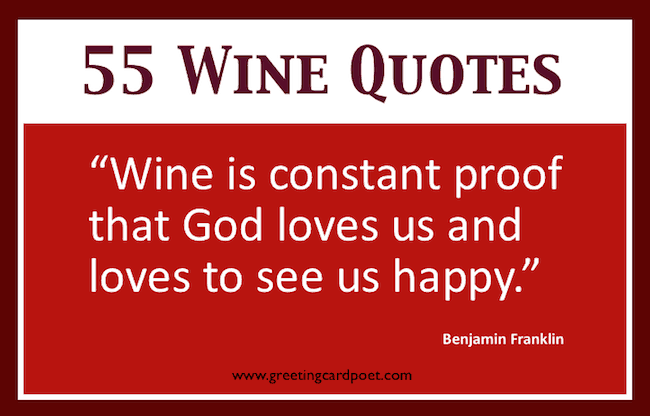 If you have any suggestions for our Wine Quotes page, please let us know on the Contact page. Thank you.